The public perception in the Democratic Republic of the Congo (DRC) of the International Criminal Court (ICC) – from the issuing of its first indictment in 2006 - has oscillated between enthusiasm and indifference. Periods of popular support for a more assertive ICC have been overtaken by the widespread view that the Court is either incapable or unwilling to respond adequately to the people’s search for justice. This is a direct result of the ICC Prosecutor’s strategy that prioritized the pursuit of relatively ‘small fish’, largely for reasons of political expediency. This approach has impeded a fuller accounting of the full scope of the international crimes committed in the DRC, and has jeopardized the Prosecutor’s independence. The prospect of the ICC assisting the DRC in its efforts to reconstruct a failing justice system helps explain the exceptionally high popularity the ICC enjoyed in the first years, especially among the Congolese legal community. These hopes, however, soon faded when the first indictments did the exact opposite. At the end of what appeared to be only a cursory investigation, the Court issued arrest warrants for people hardly thought to be among those bearing the most responsibility for crimes that were committed. The first investigations and indictments focused on the violence in Ituri, in the northeast of the DRC, bordering Uganda. Germain Katanga was one of the first indicted, but he was only the commander of a small, armed group (the FRPI - Forces de résistance patriotique de l’Ituri). Floribert Njabu, on the other hand, was the president and co-founder of the FRPI, and although he was held in a prison in Kinshasa, he was not transferred to the Hague. Njabu better matched the profile of “person bearing the largest responsibility”. Moreover, evidence produced in the Katanga case (and in the case of Mathieu Ngudjolo – annother FRPI commander) indicated that the governments of Uganda and the DRC, in conjunction with a larger armed group (the RCD-ML Rassemblement Congolais pour la democratie - Mouvement de Libération) supplied the FRPI with military support for —and jointly planned—several attacks. These attacks included the attack on Bogoro in 2003, which gave rise to the war crimes charges against Katanga and Ngudjolo. 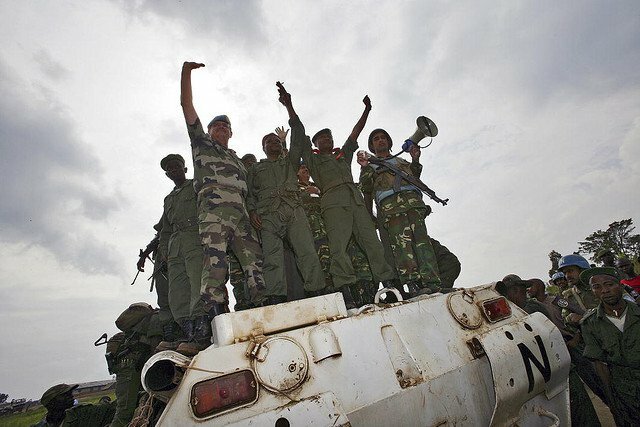 The relatively minor players in Ituri that have been indicted by the ICC and put on trial in the Hague, indicates that the Prosecutor deliberately left the most important actors—the national political and military leaders in DRC, Uganda and Rwanda who provided the militias with critical support—in the shadows. The Court has thus been unable to place the crimes in their full historical context, and is not effectively uncovering the truth. The other key problem in the ICC prosecutorial strategy in the DRC is that all but one individual currently in ICC custody are Congolese, even though the crimes with which they have been charged (and/or convicted) were committed in a territory under Ugandan military occupation. In addition, the armed groups in which they were combatants were manipulated by the Congolese, Ugandan and Rwandan governments. The perception is that this narrow focus is the result of a manipulative strategy that Ugandan President Museveni employed with the ICC Prosecutor. President Museveni referred the situation in northern Uganda to the ICC (concerning the attacks on the civilian population by the LRA – Lords Resistance Army), just months after the ICC Prosecutor announced his interest in investigating the crimes perpetrated in Ituri. The investigation of crimes committed in the Ugandan-occupied district of Ituri thus unfolded during the same period as the investigation of the possible crimes in northern Uganda, for which the Office of the Prosecutor (OTP) received the support of the Ugandan government. This included the provision of information by the Ugandan army, which was itself implicated in the crimes in Ituri. The Office of the Prosecutor must stop pursuing ‘small fish’ and return to its original promise: to indict and prosecute those actors who truly bear the most responsibility for war crimes. These parallel investigations (in northern Uganda and in Ugandan-occupied Ituri), were ongoing in the context of poor relations between Uganda and the DRC. The DRC sued Uganda before the International Court of Justice (ICJ) for damages resulting from acts of armed aggression perpetrated on DRC territory. The ICJ rendered its decision in December 2005, right in the middle of the Prosecutor’s investigation in Ituri. The decision made some interesting factual findings, including that there was “… credible evidence sufficient to conclude that the UPDF troops [Ugandan army] committed acts of killing, torture and other forms of inhumane treatment of the civilian population, destroyed villages and civilian buildings, failed to distinguish between civilian and military targets and to protect the civilian population in fighting with other combatants …”. In other words, it was highly likely that the Ugandan occupying troops were involved in the planning, the preparation, the incitement and the execution of the very crimes the ICC was investigating in Ituri. Yet not a single one of the charges brought by the Prosecutor in relation to the situation in Ituri, made the slightest reference to the ICJ decision. And therein lies the trade-off: Ugandans would be shielded from prosecution over their role in crimes committed in Ituri, in exchange for their cooperation in the investigation of the LRA in northern Uganda. If the ICC actually wants to expose the truth in the DRC, and avoid the political games of various regional actors, then the Office of the Prosecutor must stop pursuing ‘small fish’ and return to its original promise: to indict and prosecute those actors who truly bear the most responsibility for war crimes.